← Egg yolk colour – feed or breed? In the last post, I wrote about hens. Some people go to a lot of trouble to keep the heritage breeds pure according to accepted traits for that breed. It is a thankless task, but it is important to maintain the breeds. So thank you to all you who keep the breeds. I, on the other hand, am far too much of a rebel to keep a breed, so I have (quite by accident) been mixing it up, then selecting for hardiness and good foraging ability. Now I’m learning how to select more deliberately. How does this apply to saving heritage seed? Years ago, I learned from one of my farmer-mentors, Neil VanNostrand, that as a farmer, simply harvesting his grain seed and saving it to plant next year, is changing the seed. The seed is adapting to the conditions on his farm; it is dynamic. Then I read an article by David Podoll, a farmer in North Dakota, called Are We Eating Our Seed Wheat? that totally blew my mind. He explained that unless you grade (choose the best) your seed every year, it will eventually ‘run out’. With grain, this can be done by machines, because there is so much seed. I worked with Speerville Mill and the Maritime Certified Organic Growers Co-op for several years to trial bread wheat varieties on several organic farms in the Maritimes. 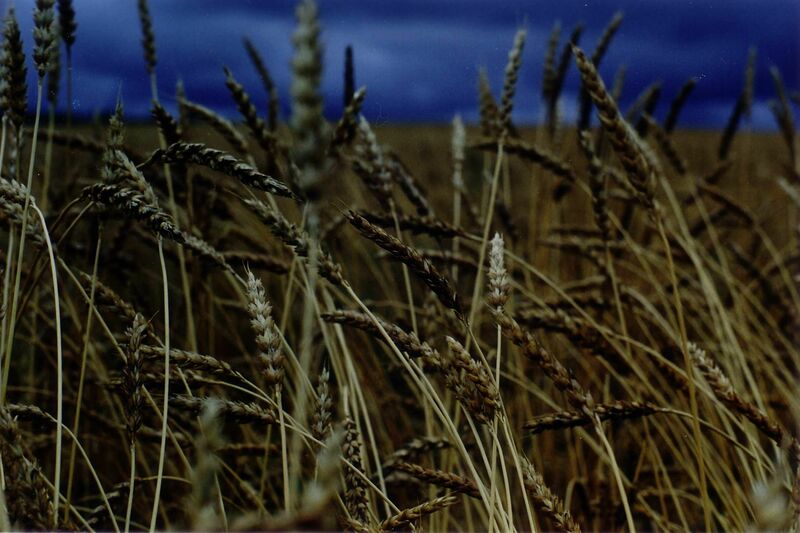 We tried modern varieties, and heritage varieties, and favourite farmer varieties (like David Podoll’s Coteau wheat). We bulked up and graded the seed, evaluated the wheat for baking quality and taste, and in 2001, after 4 years, Acadia and Red Fife came out on top. But there is a next step. It turns out that Red Fife, which was brought to Canada in the 1840s (and that is a whole other story) has some additional potential. Speerville reports that it may have some resistance to fusarium, a nasty fungal disease. Also, they report that some people who are normally sensitive to wheat can tolerate Red Fife. Heliotrust is planning to do some further selection of Red Fife and investigate these two potentials. While we’re at it, we’ll be evaluating some additional wheats from Europe and the Fertile Crescent, generously shared by Eli Rogosa of Massachusetts (see her work at http://www.growseed.org). If you are curious about this seed work, David and I have just written a backgrounder on it. Check it out… it is quite exciting! Also, we discovered that David Podoll and other farmers have created a Family Farmers Seed Co-operative (organicseedcoop.com) in the US that is VERY impressive. I think this is the way forward for farmers here in Canada too. Farmers form seed breeding clubs to share seed and observations as they select for improved seed. Seed that is more disease resistant, or matures earlier, or resists certain pests, or tastes better, or adapts to the conditions on their farms. I’m sure there must be similar breeding clubs in Canada. I can think of many farmers who save and improve seed, and I want to celebrate this activity. This entry was posted in seed saving, wheat and tagged heritage varieties, mentors, Red Fife, wheat. Bookmark the permalink. Tank you for all this information on saving seeds. I tried going to Family Farmers Seed Co-operative and the link doesn’t work. Do you happen to know the website link? I am small grower in training and would love to learn more.